On September 14, 2017, Japanese Prime Minister Shinzo Abe, visited India, and together with Indian Prime Minister Narendra Modi, announced a Japan-India Joint Statement. The Joint Statement includes the following words: "The two Prime Ministers recognized the importance of expanding Japanese language education in India, for achieving wider and closer industrial cooperation. In this regard, they decided to endeavor towards establishing Japanese language certificate courses at 100 higher educational institutions in India as well as training 1,000 Japanese language teachers, over the next five years." In response to this, the two governments of Japan and India have started to work on establishing the Japanese Language Teachers' Training Centre. Japanese language education in India began in 1954. The first university to introduce Japanese language courses was Visva-Bharati University, which was founded by Rabindranath Tagore, the first Asian to win the Nobel Prize in Literature. The university offers courses up to doctorate level and has produced many quality graduates. Later on, Japanese language education was also started at the University of Delhi in 1969 and Jawaharlal Nehru University (JNU) in 1972. However, Japanese language education at these higher educational institutions was mostly intended for students engaged in Japanese studies, especially those studying Japanese literature, and was not open to all people. According to the Japan Foundation Survey in 1974 "List of Japanese-Language Educational Institutions Abroad," there were 77,827 people studying Japanese language around the world at the time, while there were only 573 in India. India's population at the time had already been more than 600 million. Subsequently, the number of people studying Japanese language in the world continued to steadily increase. According to the Japan Foundation's Survey Report on Japanese-Language Education Abroad in 1990, the number of people studying Japanese language around the world reached 981,407, out of which 1,407 were people studying Japanese language in India. This trend continued until recent years, with the number of people studying Japanese language in India remaining at 4,253, even in 2009 when the number of people studying Japanese language around the world exceeded 3.65 million. The number of people studying foreign languages is low in India, and it is in fact not limited to the Japanese language. In this country where more than 1.3 billion people live as of 2018, it is said that more than 200 languages are spoken and there are over 20 official languages. The many diverse spoken languages have made it difficult to spread foreign language education in India. While Hindi, which is the official language of the federal government, is said to be spoken by less than 300 million people, English is considered as a second language and not a foreign language especially among intellectual people. There is a program called the "three-language formula" in India's secondary education policy. Its objective is for people to learn three languages: the official language of their state, and Hindi and English, which are the official languages of the central government. For example, the state of Maharashtra, where India's second largest city of Mumbai is located, recognizes Marathi as the state's official language. People in Mumbai speak in Marathi with their families at home and learn Hindi and English at school. Every language is not just for language study but is needed for daily living, and everyone lives in a plurilingual society. 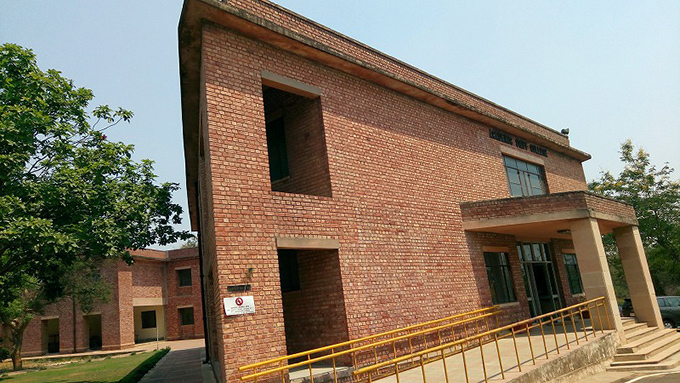 JNU's UGC-Human Resource Development Centre where the Japanese Language Teachers' Training Centre is located. Why teach Japanese language now? The aforementioned Japan-India Joint Statement gives the reason for further promoting Japanese language education in Indian society, where everyone lives by using multiple languages, as "for achieving wider and closer industrial cooperation." At the summit meeting, Prime Minister Abe pointed out that strengthening Japanese language education in India will contribute to widening the base for business and people-to-people exchanges, in response to which Prime Minister Modi expressed his understanding of the importance of strengthening Japanese language education in India, and his hopes for collaboration with Japan for its promotion. In India, a high-speed rail project using the Shinkansen bullet train system is in progress, and Japan's contribution is expected to push forward the "Make in India*" initiative. In Japan also, much attention is given to Indians as highly-skilled professionals, especially high-level IT professionals. There is "wider and closer industrial cooperation," and to this end, the two prime ministers decided to endeavor towards establishing Japanese language certificate courses at 100 higher educational institutions in India as well as training 1,000 Japanese language teachers, over the next five years. And this year on July 23, the Japanese Language Teachers' Training Centre was opened in JNU's UGC-Human Resource Development Centre. 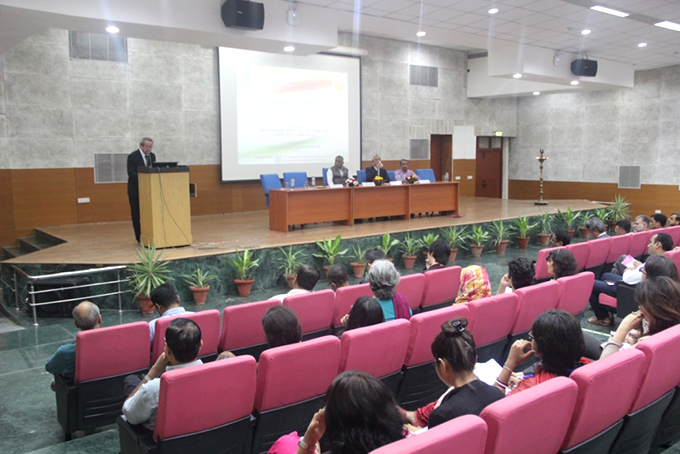 Tomoyuki Sakurai, Executive Vice President of the Japan Foundation, delivers a speech at the inauguration ceremony of the Japanese Language Teachers' Training Centre held at JNU Convention Centre on July 23, 2018. 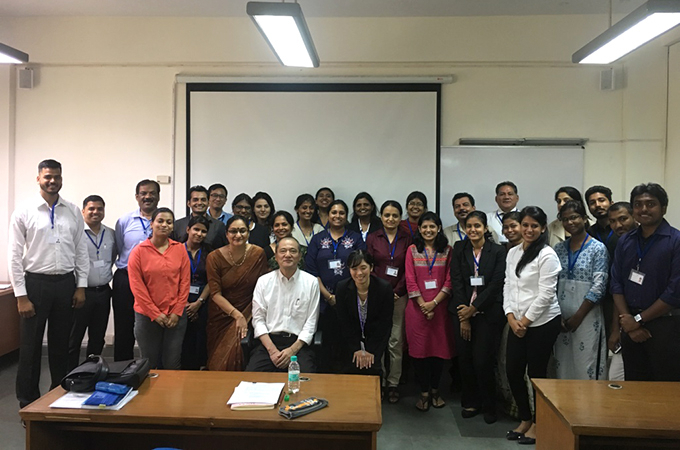 On July 23, 2018, the inauguration ceremony of the Japanese Language Teachers' Training Centre and the opening ceremony of the "Teachers Training Course A (360 hours)" were held at JNU Convention Centre. The ceremonies were attended by Mr. Kenji Hiramatsu, Ambassador of Japan to India, and Tomoyuki Sakurai, Executive Vice President of the Japan Foundation, from the Japanese side and from the Indian side, Honorable General V.K. Singh, Minister of State for External Affairs, and Prof. M. Jagadesh Kumar, Vice Chancellor of JNU, and were wrapped in a solemn atmosphere. The participating trainees seemed somewhat tense, their hearts no doubt filled with expectation as well as fear. They appeared more relaxed during the orientation held after the opening ceremony, however. There, the trainees listened attentively to the lecturer, who alluded to some rather harsh rules such as the possibility of trainees being expelled depending on attendance, academic results, learning behavior, etc., as they took a new step toward becoming teachers. We look forward to their progress in three months' time. After the end of the orientation, the trainees had to take written and oral level check tests instead of going home. Again, filled with tension, they faced the examinations. Trainees actively participating in class. From the day after the opening ceremony, a full schedule of classes began. Although the first period starts at 9:30 a.m., some trainees arrived even before 8:30 a.m. on the first day. Only a few trainees were late to class. About two weeks after the start of the course, classes began not only on elementary grammar review but also Japanese language teaching techniques such as "pronunciation" and "grammar," which trainees learned for the first time. In class, teachers need to give various attention to their students. Accordingly, trainees are required to take actions expected of teachers even in an elementary grammar review class. Some examples of this are the size of characters written on whiteboards, direction of the body when explaining to other trainees, how to hold materials when showing them to others, etc. Some trainees remarked that "they realized how much they had not given thought to until now." We hope that the trainees will discover many things in the future also. The trainees, on one level or another, all actively participate in class. Lecturers in charge face a barrage of questions even after class every day. Experiencing the project for the first time, the lecturers are somewhat confused but they enjoy teaching the enthusiastic trainees and each day is exciting. About two weeks after the start of classes, we asked three trainees about their thoughts on the classes and their goals for the future. I had studied in Japan before. As I learned about Japanese culture at community centers, and other places, I decided to spread the Japanese language after returning to India. Marugoto coursebook can also be purchased in India. I wish to use Marugoto in my teaching, but I had never learned the correct way of using Marugoto, so I decided to apply for this course. In the future, I wish to teach my students not only the Japanese language, but also Japanese culture, business manners, and the secrets behind Japan's success. I wish to give back to the society what I learned to better the world in which we live. The flow of classes in the course is well arranged and easy to understand. Although I am not sure whether I will be able to learn so many things in a short period of three months, I hope to make proactive efforts and enjoy the classes. In the state of Bihar where I come from, there are many people who have interest in the Japanese language, but because there are no Japanese language schools, people must go to Delhi to study the language. I wish to polish my Japanese language ability through this course and teach the Japanese language to the people of Bihar. The course is very hard, but all my classmates sincerely want to "become really good teachers"! Even after class going back to the dormitory, we always talk about the course. The course is very important for me being a trainee as well as a teacher. In the future, I would like to become a teacher just like the teachers who have taught me. I wish to give classes that enable students to feel "Japan" in Bihar. I have experience of teaching Japanese language for beginners and intermediate level students. Since I had not properly learned how to teach Japanese, I thought I would like to learn the appropriate teaching method and signed up for this course. Two weeks have passed since the start of the course, and I am truly happy that I am taking the course. The course provides many opportunities for each of us to express our opinions. Compared to how I was before taking the course, I feel that I am gradually developing myself. Expressing my opinion before others has made me use my own judgment and gradually given me more confidence in myself. When the course is over, I am sure that my teaching method will be upgraded. In the future, I would like to become a teacher who can help students develop themselves through various activities. From left: Ms. Tanushree Sandilya, Ms. Vaidehi Mulay and Ms. Preet Vidyanand, who answered interview questions. The trainees are seriously working on many tasks given to them every day. Answers to many of the tasks cannot be found in textbooks or sought by a trainee alone, but must be sought by developing thinking through discussions with other trainees. There could be more than one answer. In many cases, the trainees may feel that their previous style of studying does not work. However, perhaps to work as a Japanese language teacher is to overcome challenges by cooperating with other teachers and administrative staff and using trial and error. To this end, we hope the trainees will value the time spent with their associates and engage in friendly competition during the three months. There are a couple of different courses scheduled to be offered at the Japanese Language Teachers' Training Centre. The main course is the "Teachers Training Course A (360 hours)" started on July 23, which is mainly geared toward training teachers of higher educational institutions in science and engineering. The course is newly offered to 30 teachers each semester twice a year, which means that 300 Japanese language teachers will be newly produced in five years. It is a full-fledged course with 30 hours of classes per week and 360 hours in 12 weeks. Certificates signed by the Foreign Secretary of the Ministry of External Affairs of India and the Ambassador of Japan to India will be issued to trainees completing the course. 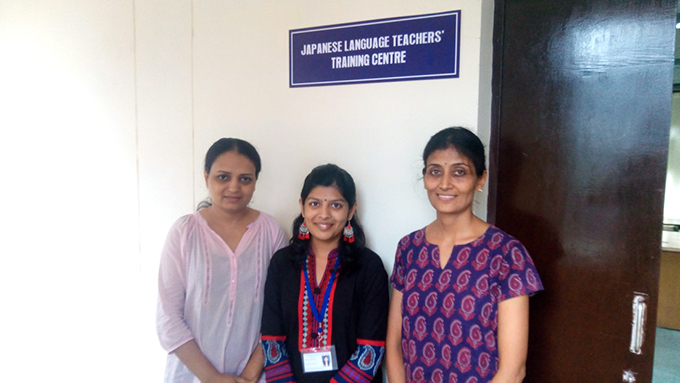 It is the first time in the long history of India that this kind of full-fledged Japanese language teachers' training course has been offered. 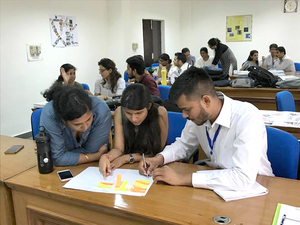 Besides Course A, the "Teachers Training Course B (30 hours)" will be offered mainly to university students studying the Japanese language, in the four areas of Delhi, Pune, Santiniketan and Chennai in India. 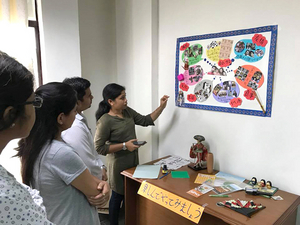 The Japanese Language Teachers' Training Centre not only cultivates new teachers, but also has the important role of providing training to professional teachers. Courses are designed so that secondary school teachers, faculty members of universities, and private school teachers find it easy to take them. Furthermore, in addition to the training in Delhi, the Centre has the important role of conducting training in Mumbai, Kolkata, Hyderabad, etc., taking advantage of the characteristics of each region. Since India is a vast country, regions vary in characteristics and uniqueness, such as some having comparatively young teachers, some with networks centered on teachers' associations, and so forth. It is important to ensure that training is consistent in all regions as well as to provide training rooted in the regions. We hope to develop the Japanese Language Teachers' Training Centre in step with the trainees as they continue to develop themselves in the future. Full-fledged teachers' training course opened at the Japanese Language Teachers' Training Centre. Trainees smiling with the lecturers after the first class. * An initiative announced by Prime Minister Modi in 2014. It aims to promote investment by domestic and overseas companies and realize effective administration to create India's high economic growth and employment. Japanese-Language Senior Specialist of the Japan Foundation. Konishi engaged in Japanese language education for over 20 years since 1993 starting from Bangladesh at the University of Dhaka, Thailand, Pakistan, China, Republic of Korea and Malaysia. 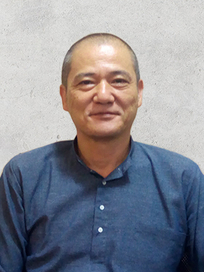 He has worked for the Japan Foundation, New Delhi since June 2016. His motto for Japanese language education is "get skilled speedily and economically." Japanese-Language Specialist of the Japan Foundation. Born in Fukuoka, Japan. 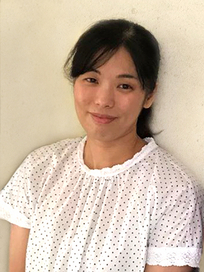 Sakemi studied at graduate school after working as a member of the Japan Overseas Cooperation Volunteers in China. She was responsible to operate Japanese language courses using Marugoto series at the Japan Foundation Cairo Office from 2015. Currently, she is in charge of the operation of the Japanese Language Teachers' Training Centre in New Delhi, India.